Today, the banks are not just managing the accounts but also insurance or estate, hence they need to inform their customers about their activities. It is important for a bank with several offices to have the identical time on all these sites and the ability to display information in real time. With the growing development of E-commerce and the account management via internet, the bank must secure their systems and date accurately their data exchanges, to avoid litigation. In trading rooms, it is necessary to display the exact time on all different trading places. Display identical time on the clocks and on all equipment connected to the computer network. 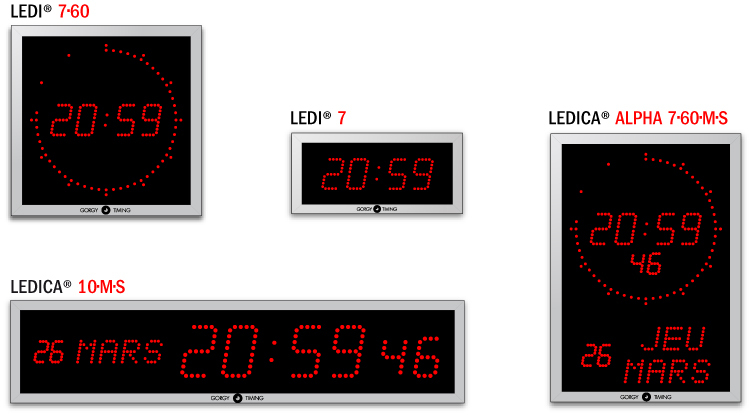 The innovative range of LEDI NETWORK TS (Time Servers) updates devices connected to ETHERNET network and clocks connected to this network. Implementation is simple : just “plug and play”. Releases NTP / SNTP, AFNOR NFS87500/IRIG B, ASCII, SMPTE outputs for synchronizing automate. Digital clock LEDI®, international timepiece, has been created with perfection, its design and its innovations are immediately identifiable as GORGY TIMING original model. The Standard version of HANDI® analogue clock range is composed of a flat aluminum case, a white dial with black Arabic numerals and hands, ensuring easy visibility.